Fluke, you may recall, infuriated conservatives who then ignited a media firestorm when she advocated for mandatory insurance coverage of contraception. For some reason, they haven’t been able to stop attacking her since. Meanwhile, these are the same folks who deny there’s a war on women. Lumping the situation in Egypt with that in Syria, he brought on Liz Cheney to bash President Obama over both to talk about the potential “need” for military action against Syria. Is there any war these people don’t love (for other people to fight)? In a hilarious graphic, a photo of Fluke appeared in front of the words, “SILENCE OF THE LIBS.” On the other side was a photo of President Obama. 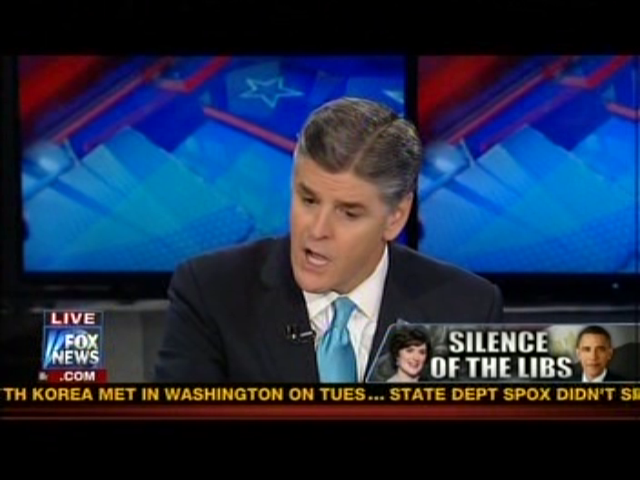 Funny, I don’t recall hearing a peep of concern from Hannity about the situation in all this time. Sean Hannity needs a lobotomy – it might give him a soul. I’d like to know why Sean Hannity hasn’t followed through on that promise to get waterboarded for charity that he made over 1,200 days ago — if he’d only get that done, the Egyptian unrest would end. Yeah, I know; the above statement makes no sense — about as much as Sean’s statement did . . .